One of the most intriguing features of the nonlinear dynamics of the past decades is the realization that even deterministic dynamics involving only a few degrees of freedom may generate random behavior. The work of Packard et al. (1980) and Takens (1981) showed that from a seemingly random behavior, valuable information could be extracted for the characterization of the dynamics underlying the system which produces the signal. Algorithms were developed whereby from the measurement in time of a single parameter of a system, phase spaces could be constructed, and the correlation dimensions of the attractors, the Lyapunov exponents and the Kolmogorov entropies evaluated (Grassberger and Procaccia 1983 a; Farmer et al. 1983, Wolf et al. 1985). Thus, one can distinguish between determnistic dynamics and random processes and classify systems according to their degree of coherence. 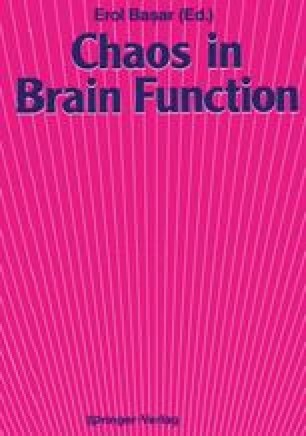 Originally published in Başar E, Bullock TH (eds) Brain dynamics. Springer, Berlin Heidelberg New York, pp 122-130 (Springer series in brain dynamics, vol 2). Cross references refer to that volume.